Projects are major undertakings that have a limited duration and require a unique approach to management and administration. This paper outlines the author’s innovative approach to use project management as a learning tool while making a contribution to the local community. Class efforts are focused on a home improvement project for an economically disadvantaged and physically disabled family. The challenge for the students is to plan and schedule the work and resources to assure that the entire project can be completed in only four days before the end of the school quarter. Through the project, students engaged in scheduling, supply management, fundraising, project team recruiting, resource allocation, time/cost tradeoffs, risk assessment, task coordination, team-building, progress monitoring, and post project assessment. Students spend two months planning for two short weekends of work, splitting into smaller teams that have to stay on budget, develop contingency options and plan the remodel from top to bottom. Additionally students contribute their own physical labor to the project. More than 50 donors, including local businesses and individuals provide financial support for the project. The paper also outlines the benefits associated with the author’s approach and the effectiveness of the strategy used to teach project management skills through service learning. Through hands-on involvement in a real project, students are able to test their abilities to take action when needed, to make mid-course adjustments on plans, and to recover from unexpected problems. The house project provides a rare educational platform that goes beyond the classroom setting into the actual implementation. Working closely with others provides students with opportunities to think about their values, how they operate in team environments, and what they want to achieve in the future. In addition it allows students to learn about and experience some of the problems faced by other people, becoming more sensitive to the needs of others. The projects have been carried out successfully on time and within budget and received broad media coverage by press (Central Coast newspaper: The Tribune Front Page lead article) & regional TV stations during both weekends in several news segment, College of Engineering Newsletters, in the (university) Cal Poly Magazine and as a cover story in the Industrial Engineer Magazine. 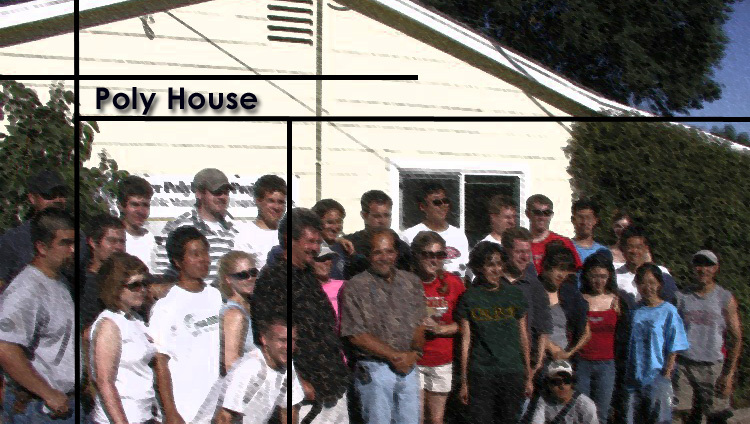 The course and project is a true example where "learn-by-doing" and “service learning” makes a real difference to a disabled and disadvantaged individual in the central coast and the entire San Luis Obispo community is made fully aware of Cal Poly student outreach. The effort that students put into this project deserves honorable mention.